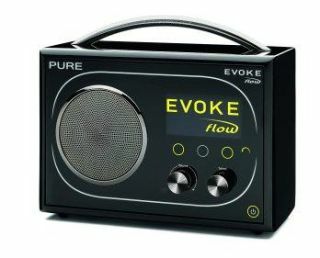 Pure's Evoke Flow 'connected' radio combines internet radio, DAB and FM in one handy box! Rajar (Radio Joint Audience Research Ltd) has released its latest figures on internet-delivered audio services this month, revealing that a third of the UK's adult population have listened to the radio via the internet. The latest Rajar figures also show that the number of users of Personalised Online Radio has increased from 2.9 million to 3.9 million since October 2008 and that 7.1 million adults now claim to have heard of "WiFi radio". The RAJAR Measurement of Internet Delivered Audio Services (MIDAS 4 report) was conducted during May 2009 by Ipsos MORI and is based on the responses of 1,153 respondents. "The fourth MIDAS survey clearly reveals that internet delivered audio listening, whether it is listening live, via Listen Again services, via Personalised Online Radio or via Podcasts," according to Christel Lacaze, Research Manager at RAJAR. "The most notable findings in this latest survey is the steady rise in those people who claim to have listened to radio via the internet and the 35% increase in POR users since October 2008," she added.